On Friday, February 8, Mid Atlantic Climbers (MAC) and Access Fund (AF) sent a letter to express our disappointment in the continued lack of public engagement in regards to Harpers Ferry National Historical Park’s June 2017 Superintendent’s Compendium, Section 13 that lists rock climbing access closures and restrictions*. The letter also reiterated our request to lift the closures of climbing in the West Virginia and Virginia portions of the park and the temporary closure to climbing on Maryland Heights due to the landslide and construction vehicle traffic on Sandy Hook Road. It is because of our longstanding commitment to working collaboratively with park staff that we were disheartened to learn in the spring of 2018 of climbing management changes. These restrictions were issued without consideration of stakeholder input and without consultation with local and national climbing organizations, and in breach of ongoing discussions between MAC, AF, and NPS staff about a future climbing management plan for the park. MAC and AF remain committed to working with Harpers Ferry to develop policies that are in alignment with NPS climbing management best practices. If progress is not made, MAC and AF intend to discuss this issue with national-level NPS administrators and to launch a comment writing campaign asking climbers to write to Harpers Ferry National Historical Park in support of removing these restrictions and developing well-reasoned climbing management strategies. 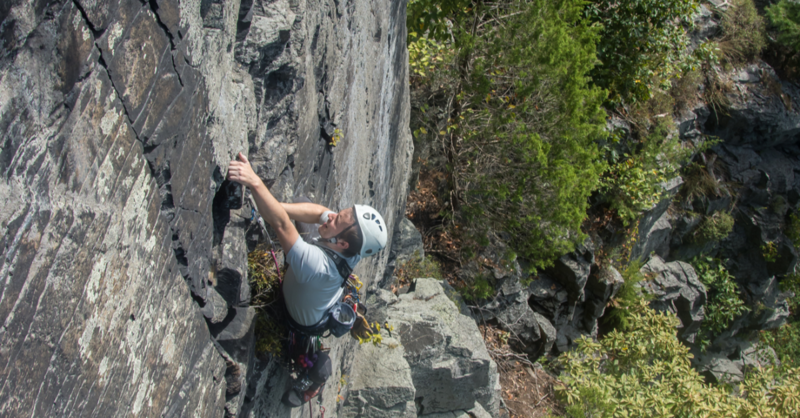 We thank you for your support, which allows us to effectively advocate for climbing access in the Mid Atlantic region. * Update: Since publishing this, the park has remove the content from their climbing page. We received no communication from the park regarding this. I am a lol Harpers Ferry resident. I use the park trail systems several times per week hiking w my wife and kids and trail running. I pick up trash on Every Run, help tourists w photos and directions, triage twisted ankles etc. I am also a climber. Speaking as a local and a climber restrictions on climbing are unneeded and unwelcome. Climbers practice the same ethic I have spoke of above. We are good Stuart’s of the land. Practice leave no trace ethics. And are ambassadors of the outdoors, and more importantly everything Harpers Ferry National Park has to offer. We are a valuable resource to the park especially in times in shrinking budgets. On almost every outing not only am I picking up trash but educating the public that are using the trail systems not to cut trails avoid going off trail explain the importance of leaving no trace and minimalize erosioan and other impacts to our shared Park. I am respectfully requesting that you please kindly receive these comments and take them into strong consideration to not provide any additional restrictions on climbing and instead reduce the number of restrictions and engage in direct dialogue with the Climbin community.